When the future of Downcity is discussed, through planning and charrette processes, one of the hottest topics is parking, or the lack thereof. The parking situation has been described at times as a “Crisis.” Above is an illustration of our “Parking Crisis.” Now not all of these lots and garages are open to the public, some are devoted to individual businesses or residences, but parking for businesses and residence is part of the crisis discussion. We do have issues with our parking situation, the lots and garages that are open to the public rarely have clear displays of their hours or rates, and more often than not attempt to gouge potential customers during special events (check out the event rates near the Dunk when something like American Idol is in town). I think what this illustration shows though, is that our crisis is not one of capacity, we have plenty of spaces to park cars. I think the important distinction, and part of the crisis attitude, is that very little of this parking is free. As Americans, we’ve become accustomed to ample and free parking. We do have free on-street parking, and this illustration does not show the multitude of on-street parking spaces. Of course what we often fail to talk about is the option of people not even bringing their cars into the city in the first place. While we have a good bus system for an American city our size, it is not terribly convenient even for people who live in the city to use to get downtown, nevermind the people arriving from the suburbs and Massachusetts. If you come into the city for dinner or drinks or a show or to go to the clubs, buses can’t be relied upon to get you home when you’re done. With many buses ending service around 8-9:00pm, we can hardly rely on that as an option to draw people into our city to enjoy our nightlife. The other issue is American’s attitudes about where they think they should be able to park. Downcity is what, one square mile? Really you could park anywhere and walk to your final destination. However people circle the block of their destination and get angry when they can’t park (for free) within yards of where they are going. I think the cure for the crisis is a combination of regulations to get parking lot/garage owners to have clear information about hours and pricing, improved public transit so that those of us who want to leave their cars at home can, and frankly, a change in attitude. What do you think about the Downcity parking situation? The biggest issue I have with the parking, aside from the lack of easily visible hours and pricing is the gouging. 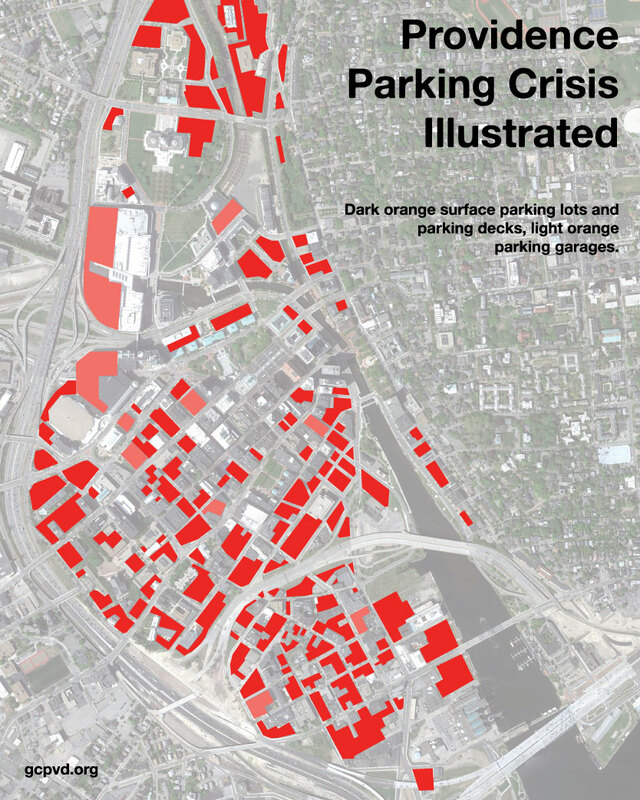 Providence needs a parking regulatory board to oversee the parking lots and keep the owners in check. There is no reason parking in Providence needs to cost $30 on American Idol nights and $15 on P Bruins nights. While I understand the laws of supply and demand, getting people into the city isn’t going to happen if they can’t be sure that they’re not going to be forced to pay $30 for parking because they decided to enjoy the rest of the city when everyone else is going to the Dunk for American Idol. Another issue with the parking is the people waving flags. I have been nearly hit in the head with the flags because they don’t pay attention to the people walking by on the sidewalk. There’s no need for people waving flags for parking when there are already big signs. Someone waving a flag is not likely to get more cars if their lot is $30 when the one across the street without the flag waver is $20. Finally, while you covered Downtown nicely, let’s not forget about nearby Federal Hill which has its own parking issues, especially since parking laws fall by the wayside on weekends with people parking in no parking zones, parking right at (or sometimes over) the corner, etc. The city needs to enforce parking everywhere within the city limits with the same gusto, even if that means ticketing people on the hill. This image is absolutely amazing. For such a small area, it really appears to be over 60 percent vacant lot. This image doesn’t even illustrate that practically every street has parking along side it as well. Unbelievable. If I can find parking in downtown DC at 10 am on a week day, people in Providence should be able to find a space. Just think of how much cooler downcity would be, how much cleaner the upper bay would be if half those parking lots became either buildings (with green roofs, of course), or pervious surfaces. You can find parking in Downcity at 10am on a weekday. You just might have to walk a few extra yards to your destination. And stop talking crazy with your green roofs and clean rivers! Like Jen and many others have said before, I think the key is in tax policy. What better way to bring about a change in attitude than to threaten Americans with the only thing they fear more than Jane Fonda, The Spanish Language, or Atheists: higher taxes. If you tax the living crap out of vacant lots, you’ll see them all show up on the market in a heartbeat. Looking at the map, one would be forgiven for assuming that parking is our city’s biggest industry. Parking *isn’t* our biggest industry? I’m willing to bet that many of these lots do not pay sales tax to the state for the revenue, although is it a sale or is it a service? I am not sure what the tax laws are. Where is Jimmy Greaves for our tax and accounting information!? To add to the dramatic of the picture, I believe you missed the Fogarty building, which is a garage (I think). That’s true, there is parking under the Fogarty Building, and it is proposed to be torn down and replaced by a parking structure. I recently moved to downtown Providence from downtown D.C. I could never find on-street parking in downtown D.C. (roughly a four-square-mile area) during the workday. On the rare occasions when I drove downtown (usually I walked or taxiied), it was ALWAYS necessary to pay $10 for a parking-garage space. At 4 p.m. yesterday in Providence, I found on-street parking just three blocks from my destination — I thought that distance was quite reasonable. And the parking meter rates were darned cheap. If folks feel a three-block walk is too much, then by all means — raise on-street parking-meter rates and either regulate the lots or give lot owners tax incentives to behave better (or else). Hey Jef – can I politely request you update this awesome graphic for the 2012 era? I know of two more parcels that should be yellow now, but I’m sure there are more. There’s also that smaller lot on the right of the State House before the bigger lot. It’s on my list of things I’m supposed to be doing. Can it be done with GIS/shapefiles? Instead of taxing value, we tax square footage. Obviously, there will have to be some formula involved that creates appropriate ‘sweet spots’ of value for different densities in different zones. I would imagine that a neighborhood like mine would want 25-30% of the footprint taken up by residences, while downcity would ratchet-up the tax rate for anyone with less than 75% of their lot as ‘enclosed space’. I can see a $0.33/sqft ‘base rate’ for property taxes (not sure how many sqft there are in the city), with multipliers for ‘improper density’ and divisors for ‘historic’ or low-income property.